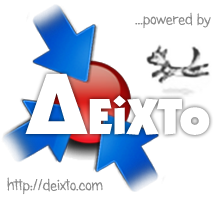 DEiXTo was cited at the Symposium “Europeana in Greece”, that took place on 2010/10/19 in Athens, Greece, as well as at the 19th Hellenic Academic Libraries Conference (3-5 November 2010, Athens). The reason for this is that we have helped some important Greek digital libraries (through scraping their websites and repurposing their data) to add their cultural content in the Hellenic Aggregator and the European Digital Library! This entry was posted in News and tagged Europeana, Hellenic Aggregator. Bookmark the permalink.